All investing involves an element of risk. In a mutual fund investors trust their money to the fund manager whose team in turn invests it in securities linked to the financial market - equities, debt, and gold depending on the fund’s nature. And the market values of these keep moving which makes the returns from mutual funds subject to risk. The risk in mutual funds investment mainly refers to the possibility of returns being different from what was originally expected. In other words risk indicates volatility of returns. Generally higher the return higher would be the risk associated with the investment. This relationship of risk and return is central to investing, which all investors should be aware of. Fundamentally it works this way because investors who take on higher risk need to be compensated with higher returns. Thus although ‘risk’ commonly rings a negative connotation for investors, who believe it is to be avoided as much as possible, it is not necessarily an evil. By understanding and managing it investors can use it to their advantage in meeting their investment goals. To be able to choose the right funds an investor needs to be aware of his/her risk appetite. Risk appetite refers to the ability and willingness of a person to tolerate loss of their investment. Individual risk tolerance is a very subjective matter and depends on one’s financial situation as well as psychological characteristics. For an overall review of your financial situation kindly take the Financial Health Check Up questionnaire. An aggressive investor is prepared to take higher risk in anticipation of higher returns whereas a conservative investor would be content with low returns in return of lower risk. Therefore the products a person aged 50 years uses for building retirement corpus may be very different from what a person aged 35 years may choose for the same goal. Generally speaking, amongst the securities that mutual funds’ portfolio are built of, the spectrum of risk would have cash and money market securities having the lowest risk at the left end, bonds and other debt securities in the middle and gold, equities at the right having the highest risk. Aligning investments with your risk appetite is important for success. For an assessment of your risk profile and suggested investment portfolio kindly visit the Asset Allocation calculator. It’s important to understand the level of risk linked to an investment product while planning to employ it. Two funds giving similar returns may not be equally attractive as one can be significantly risky than the other. 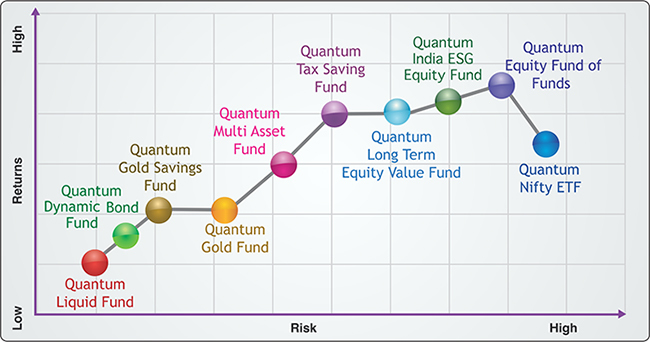 For you to be able to choose funds suiting your risk profile we have classified schemes of Quantum Mutual Fund based on their riskiness below. However first we present the basic risk measures commonly used to evaluate mutual funds – alpha, beta, r-squared and standard deviation. Beta measures a fund’s volatility in comparison with the market. The volatility of the market is 1 by convention. For mutual funds their benchmark is taken to be the market. A beta greater than 1 says the fund is more volatile than the market whereas beta less than 1 indicates it is less volatile than the market. For instance if a fund has beta 1.1 then it is 10% more volatile than its benchmark. This means when the benchmark’s return is 20% the fund’s return would be 22%. Higher beta thus means higher risk. Conservative investors would seek funds with low beta levels. Alpha measures a fund’s outperformance with respect to its benchmark. Technically it indicates a fund’s performance as measured by the difference in actual returns and the returns one would have expected based on its beta risk. So a positive alpha indicates a fund’s outperformance compared to what was expected based on its beta and a negative alpha tells a fund has underperformed than what its beta predicted. In essence alpha represents the value a fund manager adds to the fund by managing its portfolio, over and above the market’s returns. Alpha returns come from the fund manager’s ability to pick the right securities and also time the entry and exit in those securities well. Higher the alpha the better it is for investors. However for index funds, whose portfolios are supposed to be replicas of their benchmarks, alpha is not a relevant risk tool. R-squared tells how similar a fund’s performance is to its benchmark’s; or put differently how much of the performance comes solely from movements in its benchmark. R-squared values range from 0 to 1 and are commonly stated as percentages from 0 to 100%. An R-squared of 100% means all movements of a security are completely explained by movements in the index. Actively managed funds would be expected to have low R2 since their portfolio would not be identical to their benchmark index and hence their performance would be quite different from the benchmark’s. To correctly measure a fund’s risk-return in terms of alpha, beta it is important that the selected benchmark has high R2. This measure is used perhaps more than others in gauging a fund’s risk. Standard deviation of a fund, expressed as a percentage, defines how much a fund’s return has varied from its average return. If a fund has higher standard deviation its returns (as calculated from NAV) is expected to be so much more volatile. In short standard deviation of a fund represents the consistency of its performance. 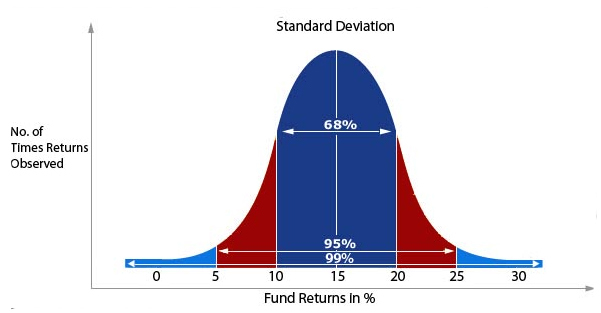 Getting a little deeper into the properties of standard deviation, in most cases the fund’s future returns would fall within one SD 68% of the time, within two SDs 95% and within three SDs 99% of the time. What this means is if a fund has standard deviation of 5 and its average annual return has been 15% then one can expect its returns to lie between 10% and 20% most of the time (or to be accurate 68% of the time) and can expect them to be between 5% and 25% almost all of the time (95% of the time). Standard deviation of a fund should be studied in comparison with its peer funds - funds of a category having similar portfolio construction. 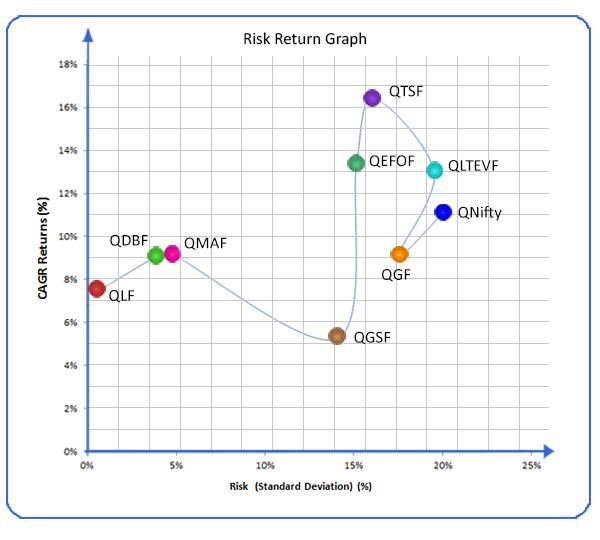 Here is a graphical comparison of Quantum’s schemes based on the high risk-high return, low risk-low return principle. The various BSE and NSE Indices are compiled on factors such as market cap, trading volume, and a broad sector representation. In doing so, the quality of the management - while admittedly a qualitative judgement - is not considered. This, in our view, represents "risk". For the increased "risk" taken, financial theory suggests that investors should get higher returns. 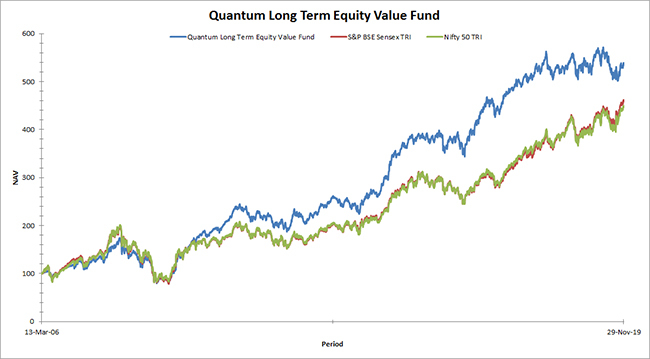 By adding an integrity screen to our investment process, the Quantum Long Term Equity Value Fund (QLTEVF) and the Quantum Tax Saving Fund (QTSF) are attempting to reduce such "risks" - and therefore might generate lower returns. To peruse the performance of our schemes please see below. Past Performance may or may not be sustained in the future. 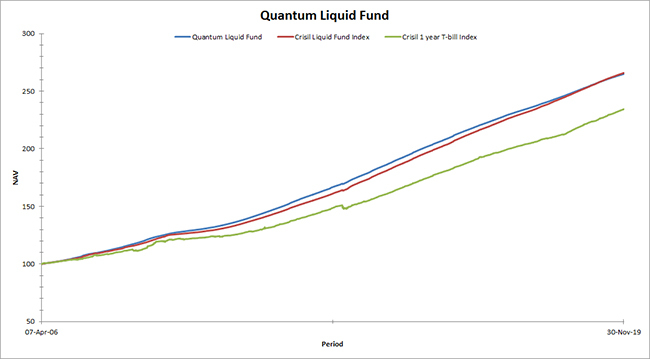 Quantum Liquid Fund which invests primarily in money market securities is expected to be in the low risk category among all funds. 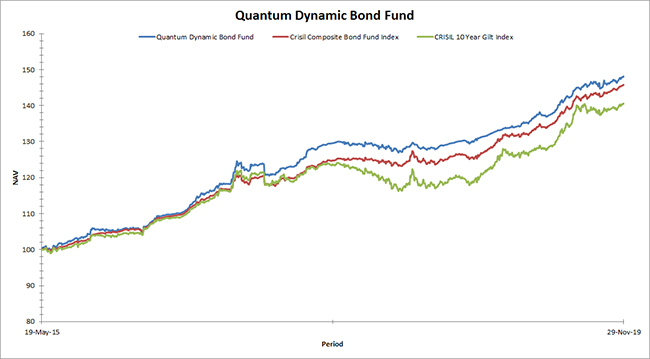 Quantum Dynamic Bond Fund invests in debt securities and therefore follows the liquid fund on this chart. 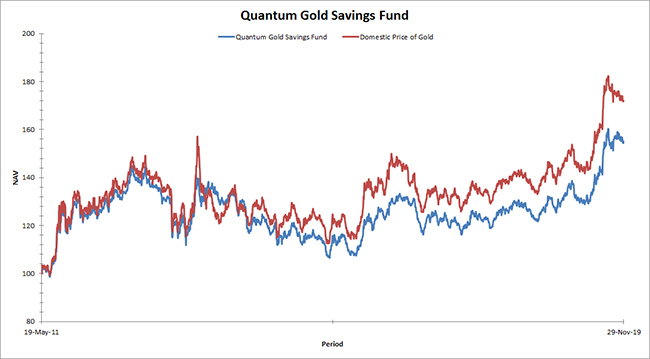 Following it are Quantum Gold Savings Fund whose portfolio is mostly composed of units of Quantum Gold Fund (ETF) along with a small exposure to liquid securities, and Quantum Gold Fund (ETF) investing in gold bullion. 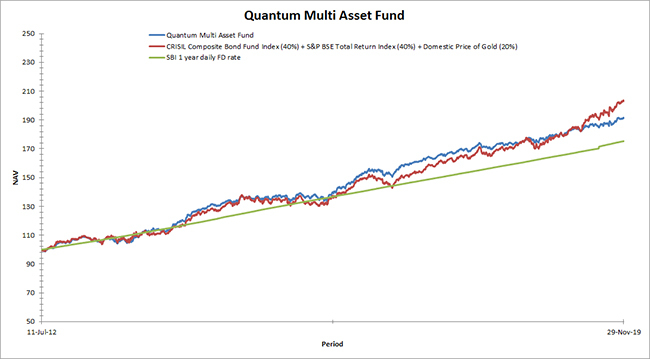 Quantum Multi Asset Fund comes next; its portfolio has exposure to equities, debt and gold. Farther along the risk chart are the equity funds. 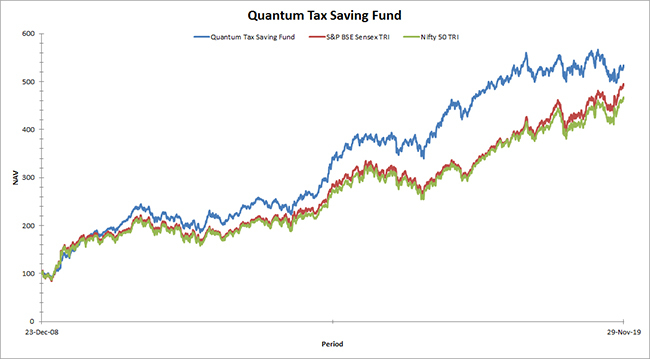 Quantum Tax Saving Fund and Quantum Long Term Equity Value Fund are expected to have greater risk than the non-equity funds. 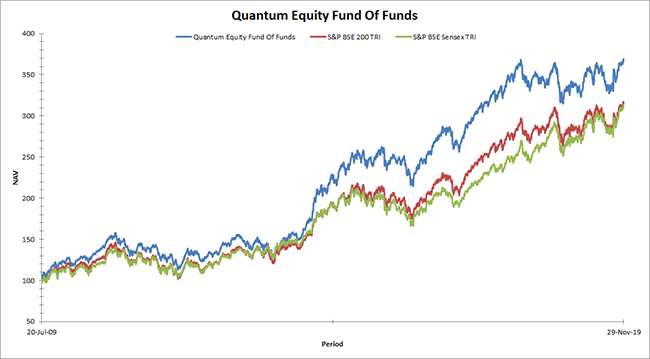 Quantum Equity Fund of Funds which invests in a basket of select equity mutual funds features next. 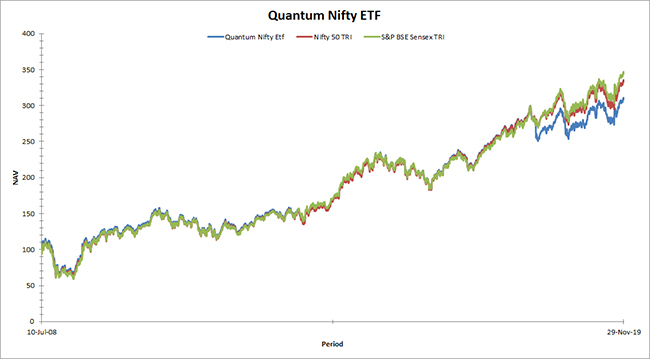 Quantum Nifty ETF (QNifty) at the farthest is expected to be in the high risk category among all funds as it replicates the index Nifty 50 in composition and has no active management by fund managers. In reality however the riskiness of funds – as known from their actual performance studied over periods – may vary from the illustrative chart based on various factors that affect performance such as state of the national economy, climate in global financial markets, exchange rate scenario, etc. 1. 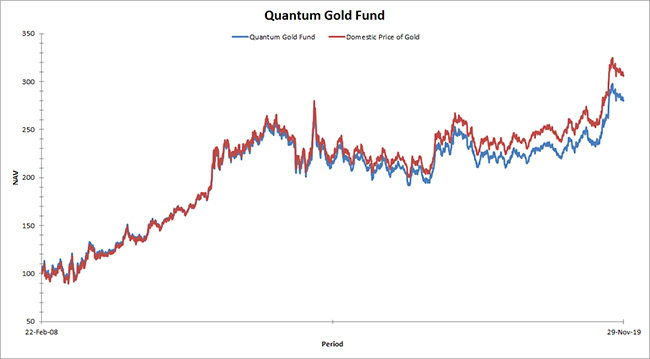 This graph attempts to shows the actual ‘Risk’ of investing in each Schemes of Quantum Mutual Fund. Standard Deviation is measure on the X-Axis and Returns are on the Y axis being actual CAGR Returns arrived from since Inception data. 3. Standard Deviation is calculated on daily returns of respective Schemes, which is arrived from the declared daily NAV’s and then annualized for respective Schemes. Now that you know to assess risk of investing in mutual funds, take a look at the following performance graphs and accompanying tables to observe volatility of Quantum’s funds in comparison with their respective benchmarks. Mr Nilesh Shetty is the Associate Fund Manager effective from March 28, 2011. Returns are calculated on the basis of Compounded Annualized Growth Rate(CAGR). The Scheme is co-managed by Atul Kumar and Nilesh Shetty. Click here for performance details of other funds managed by him. Note: NAV & Benchmark data considered for above graph as on March 31, 2019. Mr Pankaj Pathak is the Fund Manager effective from March 01, 2017. * Simple Annualized ** Returns for 1 year and above period are calculated on the basis of Compounded Annualized Growth Rate (CAGR). This fund is now managed by Mr. Pankaj Pathak from March 1, 2017 onwards. Click here for performance details of other funds managed by him. Mr Chirag Mehta is the Fund Manager effective from May 01, 2009. @ indicates the current value of Rs.10,000 invested at the beginning of a given period. This fund is managed by Chirag Mehta. Click here for performance details of other funds managed by him. Mr Hitendra Parekh is the Fund Manager effective from July 10, 2008. The Scheme being Exchange Traded Fund has one plan to invest through stock exchange and having a single expense structure. Note: NAV & Benchmark data considered for above graph as on March 31 , 2019. Mr Sorbh Gupta is the Associate Fund Manager effective from October 1, 2016. The Scheme is co-managed by Atul Kumar and Sorbh Gupta. Click here for performance details of other funds managed by him. Note : NAV & Benchmark data considered for above graph as on March 31 , 2019. Mr Chirag Mehta is the Fund Manager effective from November 01, 2013. Mr Chirag Mehta is the Fund Manager effective from May 19, 2011. Mr Chirag Mehta, Mr Nilesh Shetty are the Fund Manager effective from July 11, 2012. **The Benchmark Return for the scheme till August 2018 is calculated and shown excluding daily rebalancing of weights of 3 Asset Classes in which Scheme invests i.e. Equity, Debt and Gold. As the Scheme is a daily price scheme and to represent daily rebalancing of weights of the Asset Classes in the Benchmark to make fair comparison with scheme performance, the Benchmark computation as of 30th September, 2018 is done to daily rebalancing of weights of the Asset Classes effective from inception date of the scheme i.e. July 11, 2012 in case of Direct Plan and April 1, 2017 in case of the Regular Plan. This fund is co-managed by Chirag Mehta and Nilesh Shetty. Click here for performance details of other funds managed by him. The Schemes has been in existence for more than 3 year but has not yet completed 5 years period from inception. For an investment experience to be truly satisfying it is important that the investor has basic understanding of features of the scheme being chosen, how it works to generate returns and is aware of risks attached to the investment. This is very important for avoiding mismatch in product chosen vis-à-vis your investment need. But above all it will give investors peace of mind as they are equipped with information to make correct & timely decisions with their investment. • Expense ratio and exit load of the chosen scheme. Make sure you know how exit load would apply (if in case it would) while redeeming your investment, Cutoff time for NAV applicability during subscription, redemption, switch transactions and the turnaround time for processing these transactions. NAV affects the number of units you’d be allotted during subscription and investment value on redemption. • Tax implications on different schemes as may be applicable on your returns from the investment. • Nature and extent of risk attached to the scheme chosen. Understand that mutual funds are pass through medium which invest money pooled from investors in market securities and pass on whatever returns are generated back to investors after deducting their fees (expense ratio). Thus mutual fund returns are not guaranteed. The product label of schemes denotes their comparative risk. Investors should be aware of their risk appetite which is usually a function of their investment goal and time horizon, and choose funds whose investment objective is suited to help them achieve their goal. • Policies and procedures of Grievance Redressal and Dispute Resolution at Quantum Mutual Fund. The offer documents of a mutual fund scheme – Scheme Information Document, Statement of Additional Information and Key Information Memorandum contain information on all aspects relating to the scheme that an investor should have awareness of. Kindly go through it before making investment. Our executives would be glad too to guide investors whenever assistance is required. The riskometer in the Product Label depicts the degree of risk your principal is exposed to when it is invested in a particular scheme. It gives a quick-view of the risk level of your investment. • Invests primarily in equity and equity related securities of companies in S&P BSE 200 index. This view expressed in this article does not constitute any guidelines or recommendation on any course of action to be followed by the reader. The views are based on the publicly available information, internally developed data and other sources believed to be reliable. The views are meant for general reading purpose only and are not meant to serve as a professional guide / investment advice / intended to be an offer or solicitation for the purchase or sale of any financial product or instrument or mutual fund units for the readers. Whilst no action has been solicited based upon the information provided herein, due care has been taken to ensure that the facts are accurate and opinions given fair and reasonable. Recipients of this information should rely on information/data arising out of their own investigations. Readers are advised to seek independent professional advice and arrive at an informed investment decision before making any investments. None of The Sponsor, The Investment Manager, The Trustee, their respective directors, employees, affiliates or representatives shall be liable for any direct, indirect, special, incidental, consequential, punitive or exemplary damages, including lost profits arising in any way from the information contained in this document.